The tradition of taking tea, sandwiches and mini cakes was introduced by the 7th Duchess of Bedford, who got bored of the 4 o’clock slump and decided to do something about it. The practice spread, grew more and more elaborate, and by Edwardian times it was a full-on gowns and fine china job. Nowadays we see teas from the very traditional to the themed, but what makes a good one and where can you get it? Let's get the criteria down first. Cucumber. This is the classic, and a good test of the measure of a place. The cucumber sandwich, you see, can’t be made too far in advance. The bread should be very white and fresh, the butter pure and salty, and the vegetable glistening. Egg mayonnaise. This is fine with or without cress, but do be careful if you’re going to start adding anything else. This is an English egg mayonnaise, not an American egg salad. There definitely should not be any crunch. Some Americans put celery in their egg mayo sandwiches. Celery! Smoked salmon, with either cream cheese or butter. It will need a squeeze of lemon. Black pepper. Light brown bread. A meat sandwich. The obvious options are ham (with mustard, or even celeriac remoulade), or beef (preferably with horseradish). Some go for chicken. Few get away with it. Claridge’s do, but then they can get away with pretty much anything. After that, it’s up to the individual. A few points to bear in mind, however. Firstly, there should be no dipping of knives into chutney jars. Sweet fruit chutney (the kind you find at food markets between the painted plates and olives) is disgusting, but nobody else seems to have noticed. Also, salad leaves should be used with caution, because it’s difficult to make them dainty and the texture isn’t right for a finger sandwich. If watercress is involved, it needs to be chopped so it doesn’t come out in one long piece, pulling half the filling with it, before slapping against your chin. All or almost all of the fillings should be British, and a generous amount of seasoning is important. 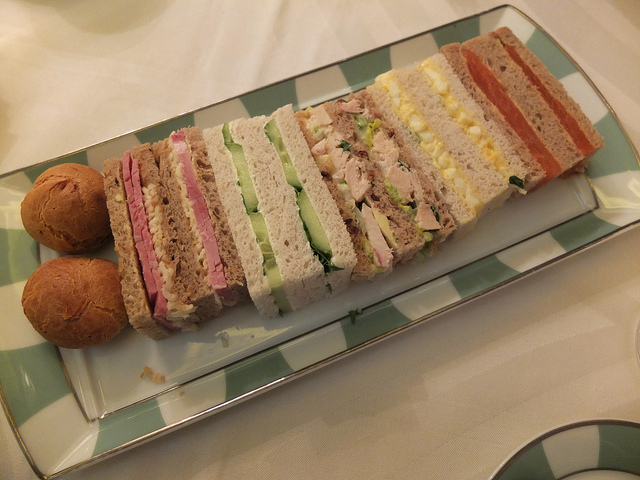 The tea sandwiches at Claridge's. Fancy. These should always be included and served warm, with strawberry or raspberry jam and clotted cream. The cream should never, ever be whipped. This does happen occasionally and it should be a sackable offence. 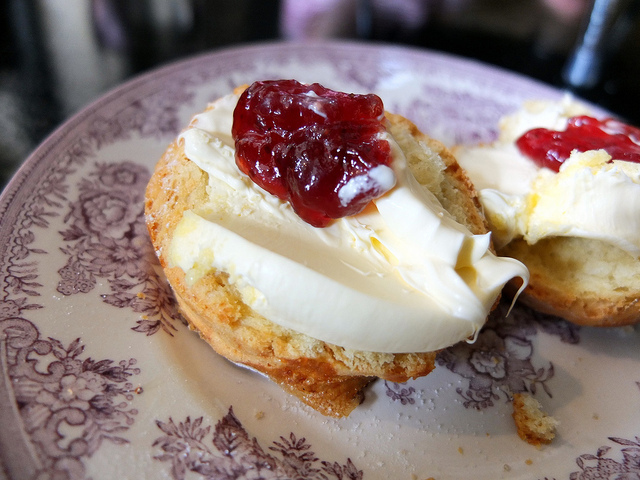 There is of course, the question of whether to apply cream first (Devon) or jam (Cornwall). Snore. Tricky area, this, as there’s so much room for variation, but here goes. It’s a tad controversial, but some sort of dainty cheesecake or moussey arrangement can be rather nice. It needs to be classy, though, with a fruit flavour; no chocolate and no cheese shaped wedges. This isn’t TGI Friday’s. There should be a spongey thing, but again, it needs to meet the visual and size requirements, which can be a challenge because sponge falls more into the WI cakes category. There should be a chocolate number, preferably adorned with spirals and twirls of other chocolate, possibly in different colours. Anything goes as long as they look like they were really difficult to make. A pastry tart is nice, with a very thin, obscenely buttery casing, filled with custard, topped with fruit and finished with a glaze that makes it shinier than Pierluigi Collina‘s head (see photo below). There should be some sort of cake which is the equivalent of the Great British Bake Off showstopper. It should have layers of things made via different, preferably complicated, techniques. It should be dusted, decorated, bejewelled, encrusted with diamonds, covered in ambergris, whatever. The point is that it should be impressive. Macarons. Are they a biscuit? Are they a cake? Are they just annoying? They seem to be the most overrated confection ever. 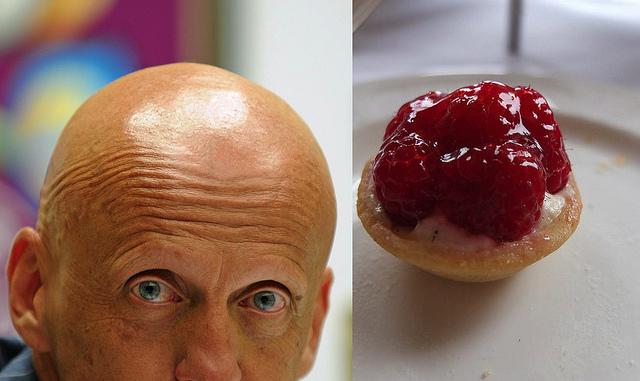 Fruit tart or Pierluigi Collina? Can we do away with these? Yes, they add some height above the other cakes and, as they’re often filled with some sort of fruit jelly, they have the effect of lightening the whole tea but, honestly, they're just a bit tacky. Also, the spoon never fits right to the bottom of the glass, which is just frustrating. If you know what you’re doing, this should be proper, loose leaf tea. There are astonishing loose leaf teas available nowadays, and because they’re not cooped up in a bag, the leaves have room to unfurl. You can get a few brews from a fat pinch, with different subtleties of flavour each time. It’s called afternoon tea, so the tea bit is very important. This is the only place that any biscuity-ness should be happening, so you want something that’s spent time on its lees (bits of yeast and whatnot leftover from fermentation). Something like Roederer non vintage should do nicely. Join author and journalist Rosie Millard for afternoon tea as she discusses her new book, The Square, a comic romp featuring the bored, over-privileged and vain London bourgeoisie. The hotel will be serving its new Summer in the City Afternoon Tea menu, including thirst quenching iced tea, scones infused with the summer flavours of coconut and pineapple, jelly ‘cocktails’ and mojito macaroons. Experience Afternoon Tea with a difference on the BB Routemaster bus. This vintage London double decker bus will drive round central London, taking in some of the city's best sights, while you can indulge in the fabulous BB Afternoon Tea. The menu includes tasty sandwiches and delicious cakes, pastries and macarons. This isn’t cheap, but it is very special. The original London supper club host Kerstin Rodgers, aka Ms Marmite Lover, hosts an 18th century inspired afternoon tea to fit with the luxurious, breathtaking surroundings in one of the capital’s most fascinating time capsules. Georgian dress encouraged! 2015 marks the 125th anniversary of celebrated crime writer Agatha Christie's birth. 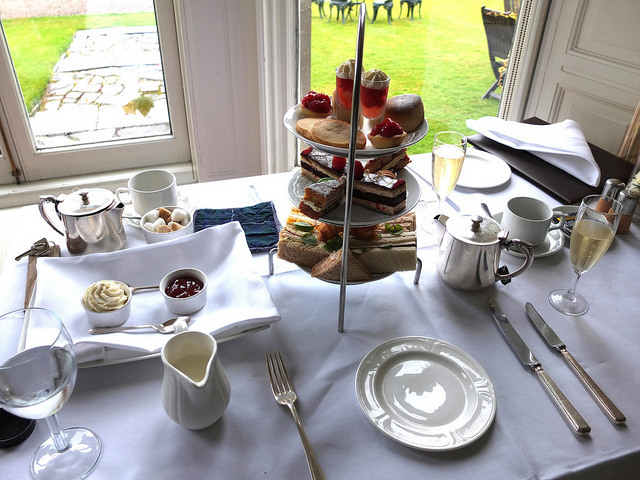 Kicking off in Afternoon Tea Week, Brown’s will be commemorating her life and love of literature in The English Tea Room, serving a special Agatha Christie afternoon tea featuring a selection of delicacies mentioned in her books and inspired by her most famous character, Miss Marple. To find more teas around London, visit www.afternoontea.co.uk. This afternoon tea article is an amended version of an article first published on Food Stories.